Of the top 10, this month all but two scores did not happen on either the 22nd or 16th. Team Discovery Channel's 70 point night at Cardinal Rule, who are also the lowest scoring Golden VHS winners in the Top Ten. As well as The Beer Barons' 117 points on the last day of September. The Beer Barons' 117 on the last day of the month, knocks both the Toilet Roll Barbies and The Bastards off the list with their previously tied 64 point totals. This is also the first time that a team from Cardinal Rule only made one appearance, meaning familiar names such as Team Name, Cunning Stunts, or The Electric Mayhem, did not make the Scoreboard this month. Unsurprisingly the 22nd and 16th were also two of the busiest trivia nights of the month on what has been quite the eventful night for Trivia Club. PETE appears twice on the list, including two of the four scores of 100 or more points. The 150 points for PETE and 116 points for Speak Softer, Russel Harder were enough for first and second in the Christopher Hitchens Cup standings, even though both teams only appeared once during the two night event that celebrated the one-year anniversary of Trivia Club at Hitch. The highest score garnered at Hitch this month was of course the 150 points from PETE, while the 70 points from Team Discovery Channel was the highest score at Cardinal Rule. The Beer Barons obtained the highest score at Lou Dawg's this month with 117 points, while 40 points courtesy of the M. Night Shyam-Aliens was the top score at Handlebar. The closest Golden VHS winning score outside of the top 10 this month was The Unusual Suspects' 59 on the 24th of September, which would bring them 13th overall. The finale of the Christopher Hitchens Cup actually has three teams in the month's Top 5. 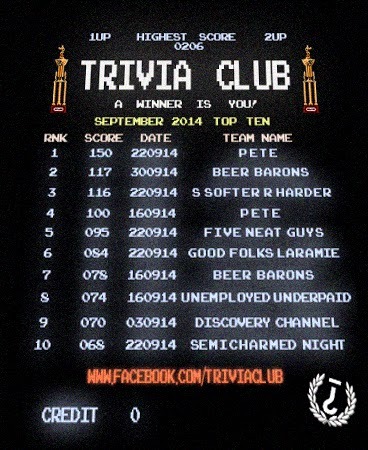 And is the month's most represented Trivia Club location on the Scoreboard with five entries.